Illumina announced two new next-gen sequencing platforms today at the annual J.P. Morgan Healthcare Conference. These aren’t pie-in-the sky products that might materialize next year. Both of them are slated to hit the market within a couple of months. And my early impression is that these are could have a substantial impact on the next-gen sequencing community. The first platform, which ships next week, essentially provides a HiSeq2500 “rapid run” in a MiSeq-sized package. 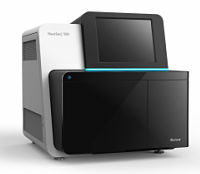 The NextSeq500 is a benchtop instrument that will yield ~125 Gbp in a 29-hour run (paired-end 150 bp reads), a feat accomplished with completely new hardware and software. Thus, it won’t be compatible with Illumina’s other sequencing platforms. The new optical technology employs a 2-dye system (current Illumina technology has 4 dyes, one for each base). On the NextSeq, each base will be represented by one dye (A and C), or both dyes (T), or the absence of dyes (a “dark state”) for G. The platform will be fully integrated with Illumina’s BaseSpace informatics platform, which now will have a secure on-site option with a private cloud. It seems to be geared at new customers who are less interested in data, and more interested in results. The big announcement, the potential game-changing platform, involves a new type of patterned flowcell. That, and a slew of new hardware/software/chemistry upgrades, allow the Illumina HiSeqX instrument to yield 1.8 terabase pairs in three days. That’s roughly 16 whole genomes. This dazzling technology has a catch: Illumina will only deliver “factory installations” of it: a minimum of 10 instruments must be ordered, and the cost is $10 million. Additional instruments are priced at $1 million apiece. Here’s another catch: the only permitted application will be human whole-genome sequencing. Illumina can only build 5 systems in the first year, and three of those are already spoken for by Macrogen (South Korea), The Garvin Institute (Australia), and the Broad Institute (USA). The first HiSeqX system will ship in March. It’s unclear who might step up to claim the other two systems; $10 million seems beyond the scope of most academic institutions, which account for more than half of Illumina’s current customers. According to Illumina’s estimates, the HiSeqX will yield human WGS at a cost of $999 per genome, and that includes hardware amortization, reagents, and sample prep. That’s assuming, however, that enough samples can be found to sequence. A single HiSeqX Ten installation will be capable of generating over 18,000 genomes per year. That’s an incredible number, and at a time when certain aspects of human resequencing (sample acquisition, consent, etc.) already introduce considerable bottlenecks. Realistically, I doubt that any of these systems will be able to run at anything near full capacity for some time. There aren’t enough physical samples to do so, and the limited application scope (human WGS) makes it even more complicated. Also, consider the data storage and informatics requirements! I’m equal parts excited and terrified about what this means for the future of next-gen sequencing.